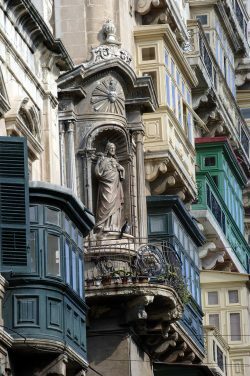 Valletta is Malta’s tiny Capital city. Although small it is packed with historic sites and in 1980 it was declared a World Heritage site by UNESCO. 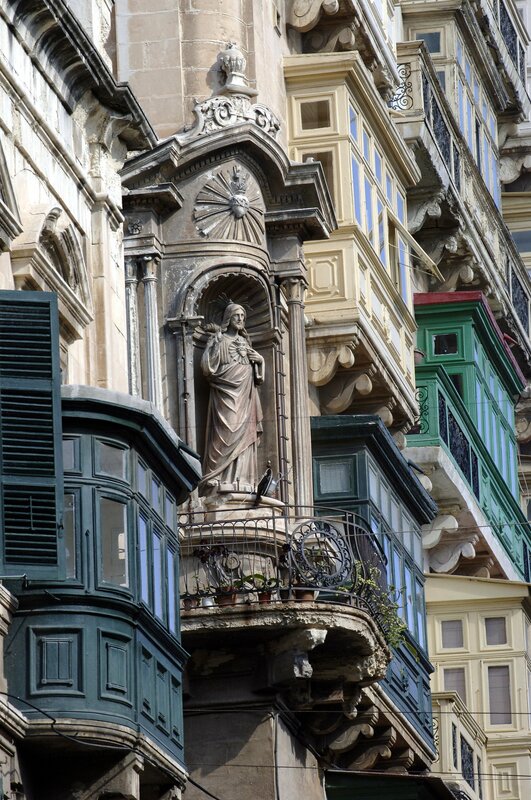 Valletta was built and founded in 1566 by the Knights of St. John. In fact, the city of Valletta gets its name from the Grandmaster, Jean Parisot de la Valette. 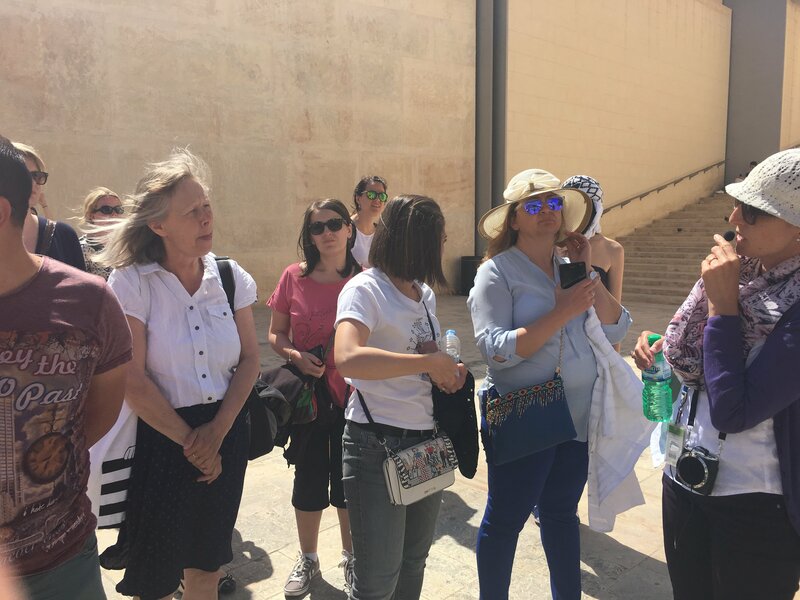 Our trip started with an orientation walk through the historic town centre of Valletta, that way we managed to get an overview of all the important buildings and sites. 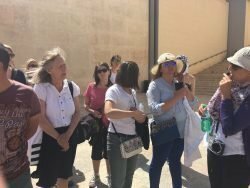 The first stop was the parliament building that was newly built in 2015 by the Italian architecture called Renzo Piano. He also designed the City Gate entrance. These modern buildings are completely different to the old historical architecture of Valletta’s buildings. They are a beautiful contrast and in my opinion, truly impressive. After seeing these buildings we walked through the streets to Castille Square to view Auberge de Castille. This Baroque building was originally built in the 1570s to house the knights of the Order of St. John from the langue of Leon. Portugal and of course Castille. 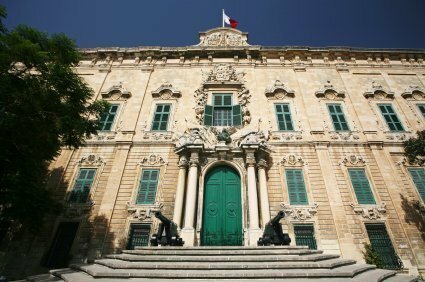 It is now home to the offices of the Prime Minister of Malta and is not open to the public. While walking I was impressed by the decorated streets, as you can see in the picture. These garlands create a unique atmosphere in the streets of Valletta. So as not to disturb Valletta’s cityscape, no noticeable advertisement is allowed. This makes up the unique charm of the old town centre and makes it feel like home. 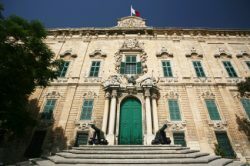 Castille Square is situated at the highest point of Valletta and overlooks Floriana and the Grand Harbour area. Other sites close by are Saint James Cavalier, the Malta Stock Exchange and the Upper Barrakka Gardens; our next stop. There we had our first free time session. The Upper Barrakka Gardens is a small, lovely garden with an impressive view of the Grand Harbour, Vittoriosa and Senglea as well as the lower parts of Valletta itself. Here you can enjoy the beautiful panorama, relax under the trees and take wonderful pictures. The gorgeous sunshine and the panorama were definitely a highlight of my trip. After a short stay at the gardens we continued our walk and visited St John’s Co-Cathedral and the National Library. During this trip we did not have enough time to visit the inside. The facades were so impressive and beautiful I wish I had had the time to follow our tour guide’s suggestion of returning to Valletta and visiting these sites again especially St. John’s co- Cathedral. St. John’s co cathedral is home to one of Caravaggio’s world famous artistic masterpiece, the beheading of St. John. Our next stop was St. George’s square, were we saw the Grand Master’s Palace. This is a very pretty square with a low level fountain that erupts at intervals. I enjoyed watching some kids enjoying themselves playing in this water fountain. 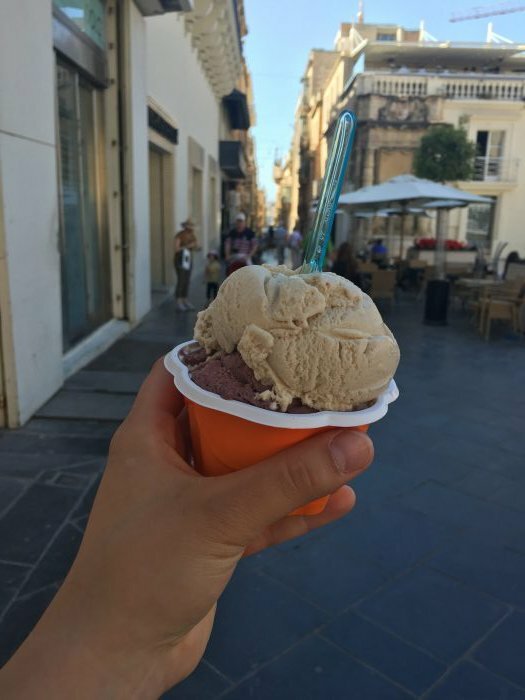 We then had some free time to explore Valletta for ourselves; the narrow streets, boutiques and eat some ice cream. The ice-cream was one of the best I’ve ever eaten. I enjoyed exploring all the narrow streets of Valletta; the city’s architecture is stunning. I particularly like the tiny colourful balconies of the different houses. 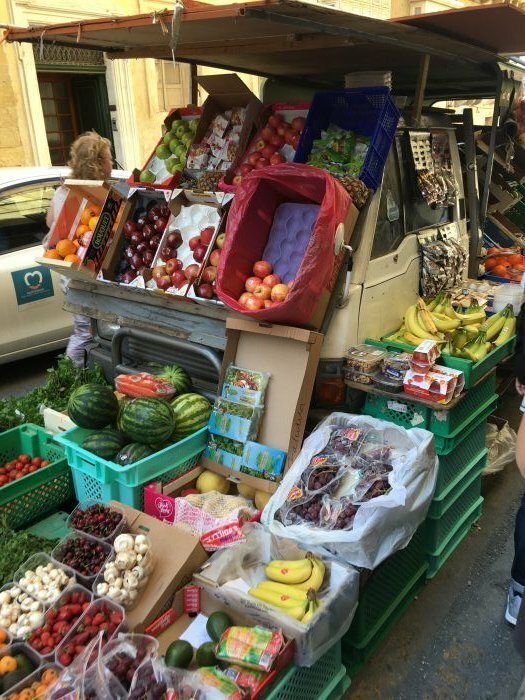 On some streets there were small vans full of fruit and vegetables to sell. During this tour we also went to see the audio-visual show, the Malta Experience. 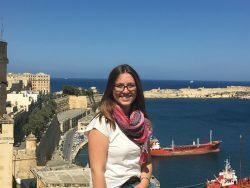 This was a very interesting show as it informed you about Malta’s unique history and culture. All in all I had a fantastic afternoon; I really enjoyed Valletta and I feel I got a detailed overview of the most interesting sights to visit. I would definitely recommend this tour to anyone visiting ETI . My name is Vera. I worked as an intern for ETI in the marketing department. During my 4 weeks stay I got the chance to get a deep insight into a foreign world of work and to improve my English skills. I worked on a number of varied tasks such as : accompanying students and teachers on a few trips, writing reports and revamping teaching material. I really enjoyed my time at ETI and Malta and I would recommend it to everyone who’s interested in internships abroad.